Aftershock is a new 'dwarf' variety introduced this year. Look at this beauty! 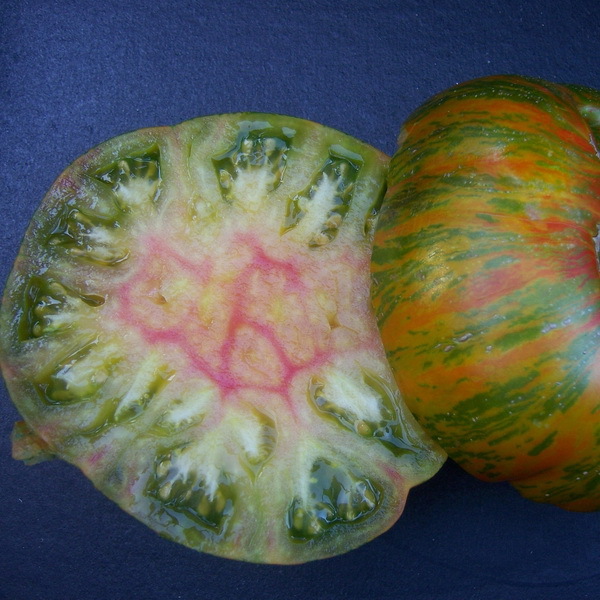 Big striking, striped tomatoes on a shrubby 3 to 4 ft. plant. A stunning red bulls-eye in the center of ripe fruits the flavor is a mind blower. Beyond delicious! Sweet with perfect tang found in some of the green when ripe tomatoes like Green Giant. Loves the heat. Great for containers or in the ground. This stunning photograph is the property of Heritage Tomato Seeds/Bunny Hop Seeds. Go see their seeds, a fabulous selection! A hugely popular tomato, Ananas Noir, French for Black Pineapple, is a stunning fruit -- incredibly beautiful. But what about flavor? What good is all that flashy gorgeousness if the flavor is dull? Well, it's not! IT IS FABULOUS! Fragrant and sweet, juicy, ambrosial with lingering notes of tropical fruit, and sunshine, luscious elaborate, unending flavor that lingers on the palate. One of my all-time favorites, I want you guys to try this one. It will blow your mind. Berkeley Tie Dye ($6.95) 80 days. This rare and wild exotic fruit with big bold luscious flavors looks just like its name implies -- with spectacular streaks and swirls of green and yellow and red and orange and green dappling inside and out. From 8 to 12 ounces, Berkeley Tie Dye is another fabulous variety from tomato breeder Brad Gates of Wild Boar Farms here in California. A portion of the proceeds of Berkeley Tie Dye will be donated to TACA, Talk About Curing Autism in the names of two very winsome young fellows, Caleb & Ethan. IMPORTANT NOTE! : Remember to water sparingly or moderately when your tomatoes start to ripen. Otherwise you'll have a waterlogged mushy tomato! This goes for ALL of your heirlooms! Brown Derby (Elser's) ($6.25) 75 days. My absolute favorite discovery this season, no contest. Combining the sweet succulence of the black tomatoes and the tangy spiciness of the greens, this is a spectacular cross of my all-time favorite, Paul Robeson, and the legendary Aunt Ruby's German Green. It arose about 5 years ago in the garden of Maria & Darrell Elser of Elser's Country Farm in Yucaipa, California and they have been selling it to adoring customers at their Southern California heirloom tomato farm stands for several years. The flavor is tantalizing--tart and sweet, a perfect combination of tang to sweetness with plenty of juice and a rapturous brown and green color. When Amazing Terry and I first tasted it in August, our eyes got wide, we grinned and stared at each other with the 'Oh-my-God-this-is-incredible' look. I could barely believe my mouth. Elser's Brown Derby has become a much sought after favorite at Maria and Darrell's Farmer's Market stands where customers arrive early to get their hands on one of these treasures. I had to scramble to get this one. True story. I picked it up, another customer implored me, but I did not budge, wouldn't give it up. I wanted it for the photograph because it was so beautiful. Then we ate it. Butterfly Cherry ($6.50) This plump multi-color bullet-shaped cherry is pink with pretty green shoulders and a rich full bodied flavor. Smooth flesh and high production. Sweet but not sugary with just enough background tang to give it old fashioned tomato goodness. This gorgeous photograph is the property of Heritage Seed Market www.heritageseedmarket.com Go see their seed varieties! Chocolate Stripes ($6.25) I'm sorry! I like to change the list a bit every year but was not ready for the hue and cry for Chocolate Stripes. After removing it from the list in 2009, I was bombarded by horrified customers who could not live without it and were freaked out by not seeing it for 2010 or 2011, so I grew it as a special order for several customers. I've been hearing more and more from folks who really want it back --so, it's ba-ack! Among the largest of the black tomatoes, this one was among the top 3 winners of TomatoFest 2007. 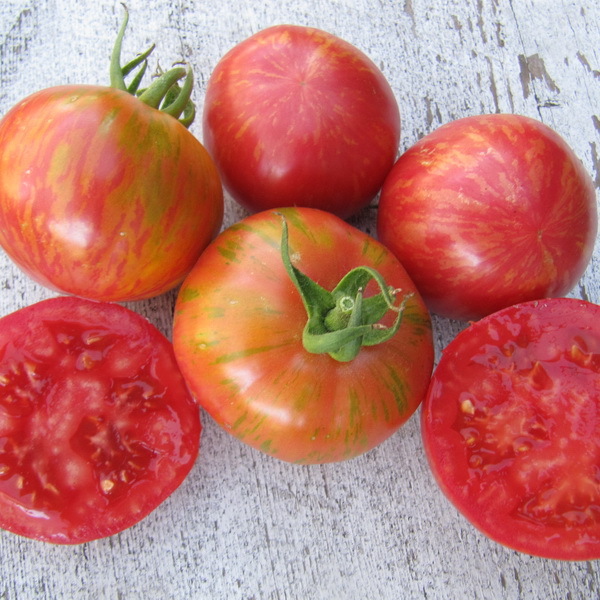 Reaching 4 inches and ripening to mahogany brown with dark olive green stripes, these fruits have enormous old-time tomato flavor and an appearance similar to Black Zebra, but huge! A plentiful harvest, stunning beauty and out-of-this-world taste make Chocolate Stripes a rare treat in your garden. Cosmic Eclipse ($6.50) 70 days. To quote Brad Gates of Wild Boar Farms who developed Cosmic Eclipse: "This very unusual variety is amazing! Smooth, 2 to 3 ounce fruits start off green with dark green stripes and striking indigo colored splashes. Fruits ripen to spangled brick-red with green stripes, complemented by of indigo streaks -- a striking multi-colored finish. Very good, sweet rich and juicy flavor. Great ability to hang on the vine ripe and stay edible better than most. Good post-harvest shelf life, maintaining superb eating quality for weeks. Very productive, too." Looks like Hubble photographs of nebulas. Dark red flesh inside contrasts beautifully with the dark beautiful skin. Dragon's Eye ($6.50) 70 days. Gorgeous, fruity, juicy and sweet, Dragons' Eye tomatoes average about 3 to 5 ounces, grow in incredible delicious bountiful clusters. Perfect for fresh eating and roasting--make the best salsa, too! Beautiful pink-rose fruits have green streaking that turns gold at full ripeness. They appear shimmery and luminescent as they ripen on the vine --inside , the flesh is deep dark red. A real workhorse of a tomato, huge production! This strong plant does beautifully in containers. Green Zebra ($6.25) (E) 72 days. Visually enchanting, abundantly productive, this 2-inch round fruit ripens to a beautiful amber gold with dark green zebra-like stripes over the amber background. Inside, the flesh is beautiful, sparkling green. Another wonderful variety from Tom Wagner, it is gorgeous to behold, tangy and deeply sweet with lingering flavors, like fine wine. This exquisite tomato was chosen by chef extraordinaire, Alice Waters, for her restaurant, Chez Panisse in Berkeley, California. In my top 5. Dagma's Perfection ($6.25) (E) 72 days. As described by Gary Ibsen, renowned tomato expert, gourmet, author, connoisseur, and owner of Carmel TomatoFest, who named this extraordinary tomato for his lady love. 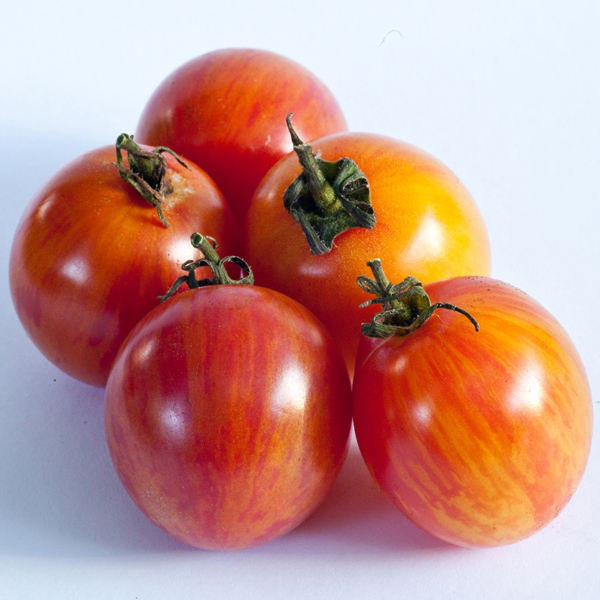 "This vigorous and abundant plant offers a bountiful harvest of medium-sized, 3" 12 oz., light yellow beefsteak fruits with beautifully delicate red striping. Deliciously flavorful with lingering sweet overtones of tropical fruit and subtle hints of lime, it is firm, juicy and elegant in the mouth. An enchanting tomato...delightful and jewel-like, just marvelous. " Dagma's Perfection is a best seller. Hawaiian Pineapple ($6.25) (B) 90 days. A huge, breathtaking and much sought after golden-orange beefsteak with fruit that grows up to 1-1/2 lbs. When fruit is ripe it has a luscious, very rich, sweet pineapple-melon like flavor and heady tropical fragrance. Add the unusually high production of this plant, and it makes my top 10 list. A real knock-out and a top-seller. Jaune Flamme ($6.25) (E) 70 days. Very prolific and stunningly beautiful, Flammé is an unforgettable tomato. Intensely orange with a reddish blush on the blossom end, these flame-colored 2 ounce globes have a rich, tangy and exciting flavor that literally bursts in your mouth. Cut open to reveal a deep red interior, this fruit reminds me of a blood orange with its spectacular contrasting colors. Fruits of Flammé appear to glow on the vine against a backdrop of deep green foliage. Just marvelous. Northern Lights ($6.25) (VE) 60 days. An absolutely striking tomato. This big, heavy 4-5", 10 oz. gorgeous yellow-orange beefsteak, with a red blush on the blossom end and spectacular red patterning in the center, is reminiscent of the Aurora Borealis, or Northern Lights, for which it is named. The flavor is sweet, intense, tangy and luscious. This marvelous tomato, only about 60 to 65 days from plant out until ripe fruit, bears beautiful tomatoes right through the cold weather up until the first frost. Add this to your Bumble Bee collection along with Pink Bumble Bee and Sunrise Bumble Bee! The Triad of Bumble Bee-ness! A Laurel's Top Pick ! Ruby Gold (Sometimes called Gold Medal) ($6.95) 75 to 85 days. A stunning beauty with thrilling, sweet tropical flavors, this was my hands-down favorite for 2016. I could not be without it. Ruby Gold has gigantic flavor, rivaling Cherokee Purple and Brandywine -- it may be as good as Paul Robeson. Cut it open, take a bite and prepare to have your mind blown. Awesome color, huge flavor, gorgeous and delicious. So prolific! I am getting dozens of tomatoes from one plant in a 30 gallon SmartPot. I have a special fondness for the multi-hued tomatoes because-- well, look at thisw thing! When I see the multi colored tomatoes on plants ripening into rainbow hues I get lusciously gaga. First offered to American gardeners in 1921 by John Lewis Childs seed company in New York, Ruby Gold was rediscovered in West Virginia in 1967 by the legendary Ben Quisenberry. Craig LeHoullier got seeds in 1987 from John Hartman of Indiana, and here it is...for you. Another fabulous variety from Brad Gates who brought us Berkeley Tie Dye and Pork Chop. The 6 to 10 ounce fruits are meaty and heavy in the hand. This reliably high producer offers intensely old-time tomatoey flavors. Luscious, juicy, rich, sweet, and irresistible. The beauty of this tomato will stop you in your tracks. Gorgeous red, marbled with golden streaks. Good disease resistance and high production will make it a favorite in your garden for years to come. Sunrise Bumblebee ($6.25) 65 days. What can I say? I've never seen anything prettier in the cherry tomato world. This a very special cherry tomato, an astounding artisan variety. Please put this plant into your garden -- but remember -- it will make you way too popular. Sunrise Bumblebee is plump and bountiful, crammed full of old- time sweet-honey, juicy, pop-in-your-mouth tomato flavors and just as cute as it can be. This is the tomato you would steal from your neighbors in the middle of the night. But don't. Just leave an empty bowl at their door with note....they will understand.